This must be the archetypal English village with its large village green surrounded by pretty stone house and two pubs. The open beck runs in front of the houses in Eastgate, each with their own private bridge. The banks of the stream are planted with flowers by each of the householders. A large flat circular stone on the green known as the whipping stone is probably the base of the old market cross but rumour has it that a man was whipped to death here in 1624. A few steps further on (past the two pubs), is the Church of St. Nicholas, according to the old vicar, the finest Norman church in the north of England with its massive square battlemented central tower on arches over the crossing of nave and transepts. Over the main door is an ancient carving “Christ in Majesty” and on one of the capitals a small carving showing the “Hound of Heaven” straining to gain entry. The iron vestry door handle is in the shape of two intertwined serpents Ð reputedly the original sanctuary handle representing the fact that there are always two sides to any dispute. Newbald (Anglo Saxon for ‘new building’) has been home to human activity from very early times. New Stone Age axeheads, from 4000 BC have been found in the vicinity and Bronze Age Barrows, burial mounds, can be seen in fields nearby and are recorded on the O.S. maps. Very recently, evidence has been recorded by the East Riding Archaeological Unit of Bronze Age settlement at a site, newly developed, close to the Village Green. The primary reason for the choice of Newbald for settlement is due to the natural water supply arising as springs in the area known as the Becksies. Newbald stone, another natural resource, from the now depleted quarry to the West of the A1034, was used in the Roman period for buildings in York and subsequently for parts of the Minster and St. Mary’s Church in Beverley. Newbald Church dates from c1125. The remains of a large Roman villa lie underground close to the village on the road to Hotham, not far from the junction of roads leading from Brough to the Roman settlements of York and Malton. By 1086 Newbald is recorded in the Doomsday Book as being held by the cannons of York, under Archbishop Thomas. Both North and South Newbald, which were separate townships till early in the C20th, have named stalls in the choir of York Minster. The land was farmed by tenants and the fact that the village had four water mills at this time suggests that they served a large agricultural function. The carting of goods was then, as now, an important part of village economy. 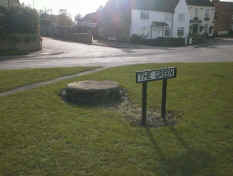 In 1348 a charter from the King was granted for the holding of a Thursday market, probably on the village green, from which roads radiate to surrounding areas, some with names ending in ‘gate’, which was used to signify street in the C13th, but some of these streets have alternative ‘village’ names: Drop Hill Lane for Townend Road and Grand Street for Burgate. In 1783 the land was enclosed and the Church seems to have played a less significant part in village life. Methodist and Baptist chapels, in four locations, became the more usual places of worship for the ‘working man’ and attendance at village hostelries must have been common as there were no fewer than five inns: the Rose R Crown, The Tiger, The New Inn (later called the Gnu), The Angel and the Fox & Rabbit, the last of which doubled as a tailor’s shop between 1840 and 1897. This was a period of self sufficiency when Newbald’s farming based community created its own trades and services as in 1871, besides those engaged in agriculture it is recorded that there were 11 joiners/millwrights, 10 grocers and drapers, 8 tailors, 5 shoemakers, 5 blacksmiths, 5 millers, 5 bricklayers, 2 carriers, a butcher, a tea vendor, a coal dealer and 14 dressmakers in the village. So what of the next 1000 years – will Newbald retain something of its self-sufficient, entrepreneurial, community spirit?